COLORADO SPRINGS, Colo. – Beginning Monday, Feb. 11, Cheyenne Mountain Zoo visitors and motorists accessing the neighborhood immediately adjacent to the Cheyenne Mountain Zoo may experience traffic delays on Cheyenne Mountain Zoo Road between Marland Road and the zoo entrance. Work hours will be Monday through Friday, 7 a.m. to 5 p.m. through approximately April 19, weather dependent. There will be intermittent lane closures and flaggers will be present to direct traffic. Motorists and zoo guests can expect delays and neighborhood residents are encouraged to take alternate routes. 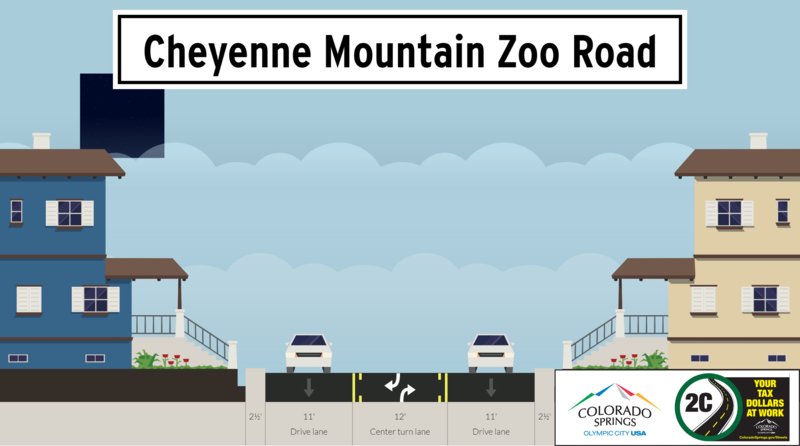 In tandem with 2C-funded paving, crews will widen Cheyenne Mountain Zoo Road and add a dedicated center turn lane to better facilitate emergency vehicles, improve access to neighborhood streets and reduce traffic congestion along the roadway during peak hours.